Rather than play famous outlaw Cole Younger in this film, Warner Bros. contract star Humphrey Bogart chose suspension. Ronald Reagan was considered, and so were James Cagney, Edward G. Robinson, and George Raft, but, happily, the role eventually went to the more age-appropriate Dennis Morgan, a former band singer. 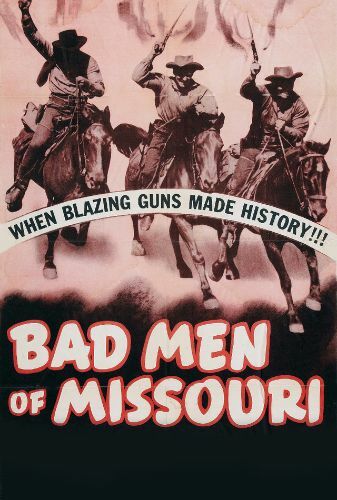 Like MGM's Billy the Kid, also from 1941, Bad Men of Missouri emerged as a complete whitewash of the title outlaws. Returning from fighting on the Confederate side in the Civil War, the Younger brothers -- Cole (Morgan), Bob (Wayne Morris), and Jim (Arthur Kennedy) -- find their money no longer viable currency and their homestead about to be usurped by carpetbagger William Merrick (Victor Jory). Standing up to Merrick and his chief henchman, Greg Bilson (Howard DaSilva), old Hank Younger (Russell Simpson) is shot dead, and, in frustration, the sons take up train and bank robbing, eventually joining the even more notorious James brothers, Jesse (Alan Baxter) and Frank. Of course, the celluloid Youngers steal only from the rich to give to the displaced poor. When they are finally caught in Minnesota, the citizenry of Missouri, viewing the Youngers as local heroes, take up a petition for their immediate release. Despite the many historical inaccuracies, Bad Men of Missouri makes for exciting, fast-paced Western entertainment; quite the opposite, in fact, of MGM's staid, overly glamorous depiction of Billy the Kid. Filmed at Sonora, CA, and cast with veterans such as Erville Alderson, Sam McDaniel (who replaced Willie Best in the role of the Younger's devoted servant), and a very funny Walter Catlett, the film premiered in Harrisonville, MO, the birthplace of the Younger brothers and the town where the elder Younger had once been elected mayor. Jane Wyman appears as the nominal heroine, the upstanding girlfriend of Jim Younger, and the film marked the screen debut of Faye Emerson as Cole Younger's ill-fated fiancée.